2 functions in 1 product: it is a gear indicator and in addition it eliminates the limitations in the gears and also the speed ones in 6 ^, where present. Easy to install, with dedicated wiring, requires no modifications. 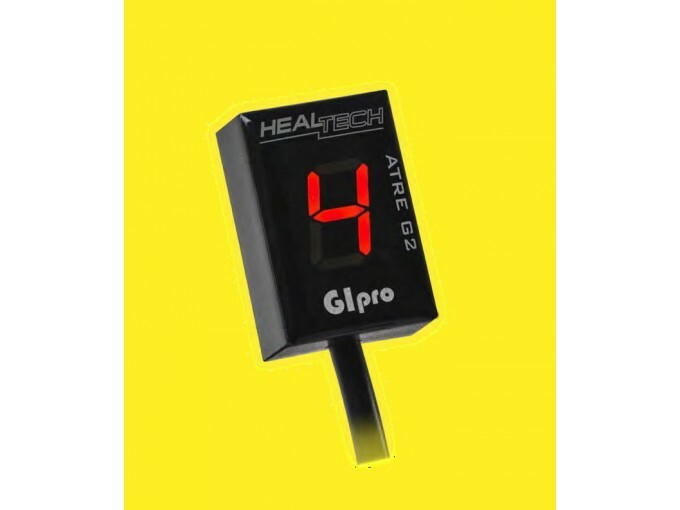 GiPro ATRE G2 is equipped with 7 selectable modes (+1 bypass) for eliminating ignition limits, which improve engine performance and response. The choice is made by a pressure sensor positioned on the display. The function must be activated. The sixth limiter release function is present on the units intended for 1000cc models and beyond for Suzuki production. 5 colors available for the display: blue, red, green, yellow and white. Automatic adjustment of light intensity for night use. Fast and accurate: accurately and quickly indicates the gear engaged - the sampling time can be adjusted to obtain a more or less fast response, according to the speed of change or the conditions of the signal. Pressure sensor: all the adjustments are made through a sensor positioned on the upper part of the display, positioned inside and not visible outside the display which is completely sealed. So the "touch" area is the top of the display. The display can also be fixed using the Gipro Mount accessory available separately. Very little is needed for assembly. It takes 10 minutes (30 on some Kawasaki) and does not require fairing or instrumentation removal. TRE (timing retard eliminator - ignition delay exclusion) - Activating this function (which is otherwise deactivated in the unit as it is delivered) improves motor response and acceleration in low gears. In addition, the maximum speed limiter is unlocked on 1000cc and above Suzuki models. The TRE is automatically deactivated in neutral, and is automatically reactivated when the gear is engaged. The GiPro display always correctly indicates the gear actually inserted. Self-learning: The unit is programmed for target models and is plug-n-play. If necessary, it is able to automatically learn the gear engaged by activating the self-learning function from the menu. Does not interfere with other devices such as Power Commander or SpeedoHealer.